Minneapolis Municipal ID passes first committee vote | Fight Back! 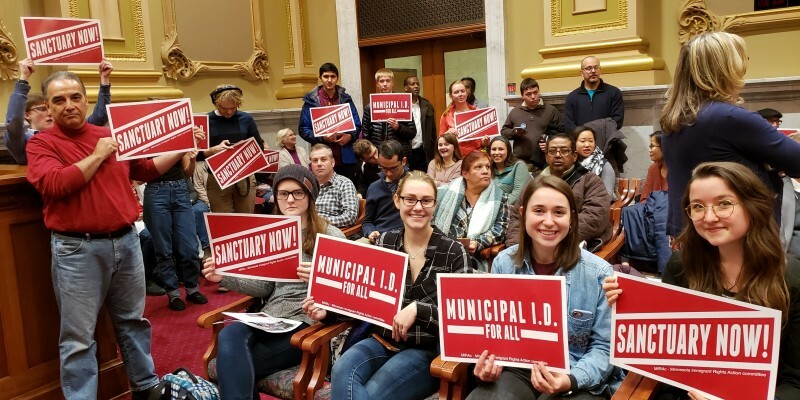 Minneapolis, MN - People holding signs reading, “Municipal ID for all” and “Sanctuary now!” packed into the Minneapolis City Council Public Health, Environment and Civil Rights Committee hearing November 26. They came to give testimony and to encourage the city council to create a Minneapolis Municipal ID. Dozens of Minneapolis residents spoke to their need for an ID due to immigration status, gender identity, housing instability, age and other reasons. After hearing the testimony, the committee voted unanimously in favor of creating a Minneapolis Municipal ID. The vote of approval from the committee forwards the ordinance to the full city council for a final vote on December 7. The immigrant rights movement has led the push for creating municipal IDs in cities around the country, especially within states where immigrants are excluded from obtaining drivers licenses or other official government identification. Speakers at the hearing talked about how the lack of an ID makes everyday interactions difficult or impossible, like picking up medical prescriptions, picking up kids from school, renting an apartment, or opening a bank account. Most importantly, any interaction with police is dangerous when you can’t identify who you are; in such cases police will often arrest a person and bring them in to jail for booking to fingerprint and identify them even if they have done nothing wrong. Once in the criminal justice system, Immigration and Customs Enforcement (ICE) often intervenes and starts deportation proceedings against someone who can’t prove their immigration status. This is a large source of the skyrocketing deportation rates over the past decade. In response, several cities around the U.S. have created a municipal ID in recent years to extend the democratic right of an official identification to people who are excluded or discriminated against with other types of official identification because of immigration status, gender, housing stability, age or other issues. The campaign for a Minneapolis Municipal ID has been pushed forward by community-based organizations like the Minnesota Immigrant Movement (MIM), the Minnesota Immigrant Rights Action Committee (MIRAC), among many others. MIRAC launched a Sanctuary Platform in September 2017, which included 13 things the Minneapolis city council could do to protect Minneapolis immigrant residents from the Trump administration’s attacks. One of the biggest points on the platform is the creation of a Municipal ID. So far, the city has implemented at least four of the platform planks, and is one vote away from creating a Municipal ID. This is a significant step toward a victory for democratic rights of all Minneapolis residents. The next steps in the process are budget hearings and then the full city council vote on December 7. MIRAC, MIM and others are mobilizing for a large community presence for the December 7 vote.